The system’s interface is clean and simple, making it extremely easy to use. Patient Pro allows you to input and view contact and personal details about a patient, as well as allocating any practitioners used by the patient and their medical aid details. 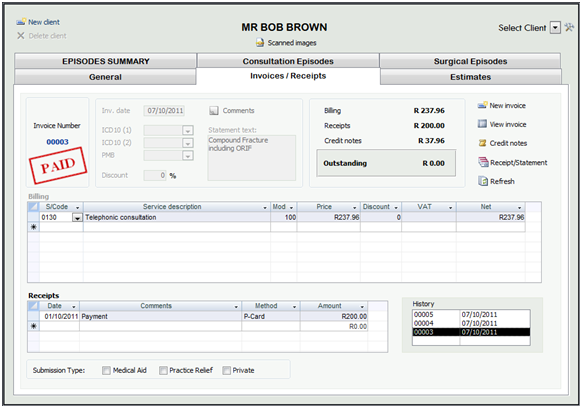 If the patient is the main account holder, they can be shown as such, as well as displaying any dependents. 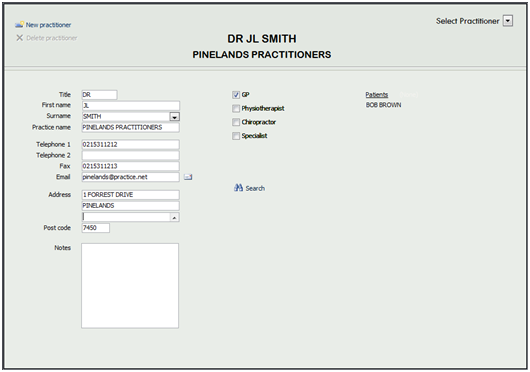 If the patient is a dependent, the account holder name is displayed. In addition to inputted data, all documentation to do with a patient – whether it’s a copy of their ID or Patient Data form, scanned images or investigations results, or any other patient documentation – is accessible through the system’s interface. This is achieved through an automatic scan of a patient’s folder; so once a document or image has been saved, it will automatically appear as a link in Patient Pro, giving you access to all of the patient’s records from a single source. Details of each consultation and surgical episode can be recorded, along with a follow-up appointment, which can automatically be assigned to your Outlook calendar. If any investigations have been requested, they can be recorded here and when the results come in the system will automatically pick up that they have been received. Similarly, prescriptions may be generated and printed directly from the system. Consultation and surgical notes may be captured, and template-based letters can be generated that can be emailed, faxed or printed. 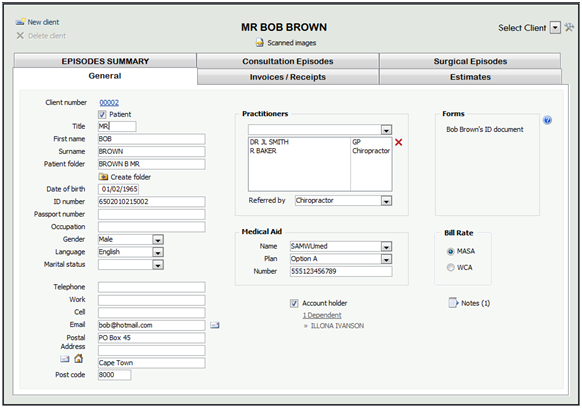 The Episodes Summary tab displays a summary of all consultation and surgical episodes. Create invoices with line items based on a pre-loaded list containing service codes and the associated MASA and WCA fees. 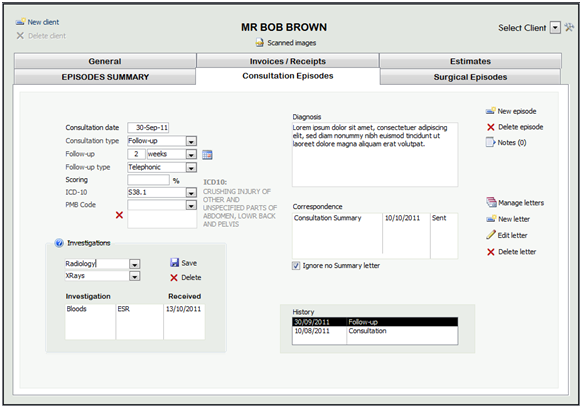 The system allocates the relevant feebased on the MASA or WCA option selected on the patient details form. Any payments received or credit notes issued can be recorded against the patient’s invoice. Statements can be generated, showing details of invoices, payments and credit notes, as well as an age analysis breakdown of any outstanding fees. 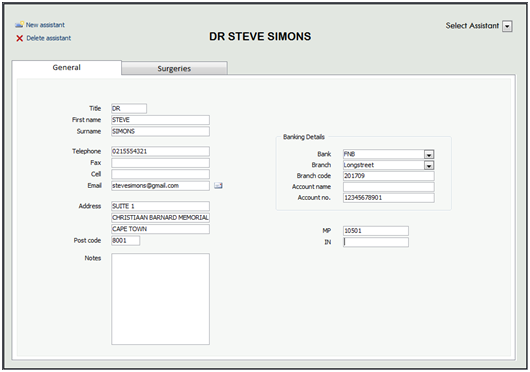 Record contact and banking details for anaesthetists and surgical assistants. On the Surgeries tab, you will see a history of surgeries in which the anaesthetist or assistant has participated, along with any fees due. Record contact and other details for medical aids and practitioners. For quick reference, a list is displayed of all patients assigned to the current medical aid or practitioner. A series of standard reports such as Unpaid Invoices, Assistant Fees and ICD-10 analysis are available; but if you require additional bespoke reports, they can be developed and integrated into the system.